The trails are closed. The fish aren’t biting. So it’s a good time for a brief January 2015 club update. February 28 -- Club Board Meeting - Ideas Wanted! The club’s 9-member board will get together and start planning club meetings, rides, and community events we’ll be part of in 2015. Please reply to this email with any and all ideas on trails you’d like to ride this year, new club gear you’d like the club to make available, and other things you’d like the board to add to the list. Our focus this year will be on riding and having fun! March 6-9 -- ATVAM Vision Conference. All ATVAM members are invited to ATVAM's Annual 2015 Vision Conference and All Membership Meeting, March 6 - 9 at Sugar Lake Lodge in Cohasset. This is a chance for ATVers across the state to come together to share concerns and celebrate successes. The cost to attend the Vision Conference is $40.00 per attendee (which the club will reimburse) and will include printed handouts, a delicious Saturday lunch and morning refreshments/snacks both Saturday and Sunday. You can attend just Saturday for the main meetings if that works for you. Please reply to this email if you plan to attend, and register by February 20 using the form at this link: https://files.ctctcdn.com/564eb3f9001/ee174466-482f-4592-a1cd-2a3b81da6537.pdf. Join ATVAM today! 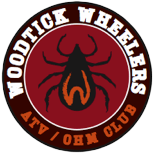 -- Our club is very involved in ATVAM to help protect our right to ride and work with the DNR on ATV rules and regulations. To learn more about ATVAM and to join, see their web page at atvam.org. 2nd Annual Bullhead Feed (Date TBD) -- Last year’s fish fry in early May was a huge success. We packed the Legion and ran out of fish dinners. This year we’re ordering twice as many bullhead, which taste great deep-fried and served with buns, cole slaw and other goodies. Lewie Schrupp is organizing this event and is working with Legion Post 202 to set a date. We’ll update you with more details in the near future. Will we have to ride our Rangers and RZRs in the ditch of county roads this year? We’re getting that question a lot. The 2015 DNR regs say any vehicle under 1200 lbs. (was 1,000 lbs earlier) will have to now ride in the ditch of county roads. This is creating a lot of confusion. There is a work group of ATVAM, DNR and state legislators working on a new ATV definition. And we’re speaking up as a club. We’ll see what happens and let our members know asap.